Matt quickly tidies up the living room a bit and asks Mr Reeves to sit down, apologising for being so disorganised this morning. Mr Reeves asks to meet Sky and Joe looks worried. Madge is trying to dress Sky, but Harold and Sky are more interested in doing aerobics! 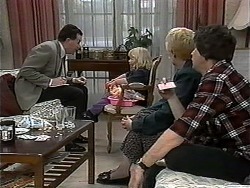 Madge says she's very busy today, so she'll ask Joe if she can take Sky to the creche. Josh comes to call for Todd to go to school, and while he's waiting, leans over Jim's engine plan. Jim explains a bit about the engine and says it's a new type. Jim tells Helen that he won't be in for dinner - he's going to go to the Motor Show in the City and invites Josh and Todd along. Matt and Gemma sit down and order coffees. Harold tells Gemma that she should be studying and Matt is a distraction. They assure him they will be studying together. Joe is trying to explain why Sky is staying at her grandparents but Mr Reeves doesn't seem convinced. He also thinks that Joe can't give adequate attention to a child since he's working long hours. Joe protests and says he has Madge and Harold to help him. Just then, Madge arrives and immediately moans on about Sky giving her the runaround. Joe tries to stop her talking, but Mr Reeves has already overheard. Mr Reeves is talking to Sky herself, asking if she has fun at the playgroup and whether she likes her father's friends. Sky says yes to everything. Mr Reeves leaves, telling Joe that he'll have to review the situation further. When he's gone, Madge apologises to Joe, but he says he messed everything up himself long before Madge got there! Matt and Gemma are studying but not doing too well. Madge comes in and glowers at Matt, saying he's a distraction to Gemma, but lets it go for now. 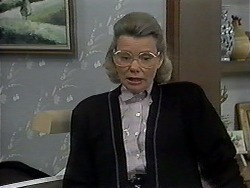 Madge has been going around the council telling them all about Felicity's dodgy dealings. Matt is looking forward to his first shift tonight and Madge tells him he'll have to impress - Paul doesn't usually take on people with so little experience. Jim is cutting up wood with Cynthia the circular saw, while Josh grills him about becoming an inventor. 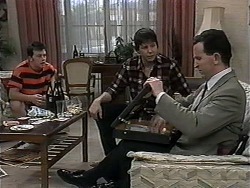 He tells Jim he's invented some stuff himself - like remote controlled planes and boats. 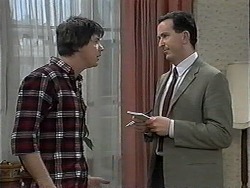 Jim offers him the use of Cynthia as long as he supervises him. Josh is chuffed and accepts. Madge is nagging Harold telling him that he must make sure that Gemma studies tonight - she has to go and help at the Waterhole as they're short staffed. She also tells him about the visit from Mr Reeves from the family court this morning and asks Harold to go round and give Joe moral support. Jim and Josh are discussing his engine, but Todd isn't at all interested and is listening to music. Jim is hoping there won't be anything similar to his engine at the Motor Show. Helen tells the boys about the unlucky car that was crashed - the No.13 car that Gail's first husband was killed in. Matt is lying on the settee listening to music and Gemma sneaks up on him. She's having a break from study. They start messing about hitting each other with cushions but just then Madge comes in and looks stern. Joe is very worried about Mr Reeves reporting he's not a good father - the way the family court will see it, he's going out drink and palming Sky off on her grandparents. Harold assures him that all Sky needs is love and Joe gives it to Sky in enormous quantities. 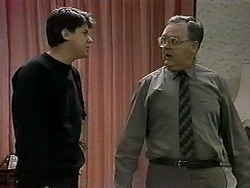 HAROLD: And I'll tell you something else too. I'm her grandfather and there's noone I trust more to raise her or be a good father to her! JOE:(stunned) I appreciate you saying that, Harry. HAROLD: Don't you thank me. If I've got a high regard for you, it's because you've earned it. Stop worrying. Everything will work out alright, you'll see. Joe invites Harold to join him for dinner, but he has to go and pick Madge up from the Waterhole. Matt is working his first shift. A friend of his called Mario is at the bar and asks Matt to do some work on his car. Matt says he'll have to charge him, but he says he doesn't have any money. He offers him an old motorbike in exchange. but Matt says he doesn't need one. Gemma comes in and Matt tells her he doesn't like her wandering the street at night. (Well, what a coincidence!!) Matt chases after Mario with an idea. Jim is back from the motorshow and says the boys seemed to enjoy themselves. 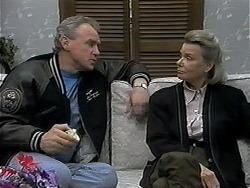 He tells Helen that he'd like to spend more time with Todd - they seem to have drifted further and further apart lately. Helen suggest buying an old car and getting Todd to fix it up with him. In the kitchen, Todd and Josh are looking at a car catalogue. Jim approaches them and says that sports cars are inefficient. Todd huffs that he was just having a bit of fun looking at the catalogue. 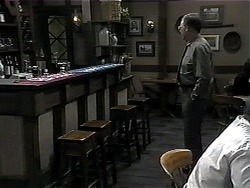 A bloke comes in, and since Gemma is minding the bar, she serves a bloke called Wally, telling him her name is "Dorothy Burke"! 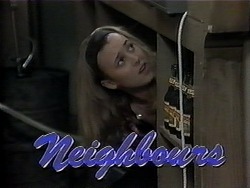 Harold comes in and she hides behind the bar!